Despite being an architect, I don't have a finite idea of what my dream house would be. Rather, I have many random details that I would love which include....wood laminate flooring, lots of storage, exposed rafter ceilings... but most of all. 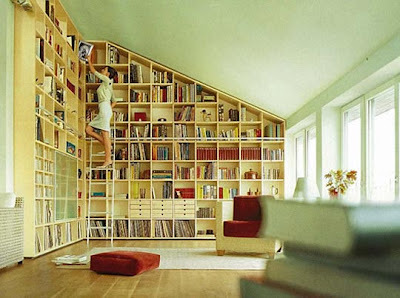 I MUST have a reading room with wall to wall shelves of books, books, books. See below. I'm in love. Day 004: Not so sweet sweets!